The Kidder Group has a very defined niche in the marketplace. We represent companies who are proven leaders in their industry; they are strong financially, have a management team who leads by example, and insist on an engaged and passionate work force. The company must be committed to excellence, set World Class Standards, and believe in Continuous Process Improvement as a way of life. These clients are true believers that the top performers will out-produce average performers by as much as ten fold. We recruit candidates who are seasoned manufacturing professionals in the top 20% of their peer group, and we define this by past accomplishments with quantifiable achievements and long discussions about their philosophy of management and leadership. Our process starts with a strong foundation. Our partnership requires that we meet the hiring managers in person. We’re going to dig into the position scope; departmental objectives; expected and quantifiable milestones for 90 days, 6 months and 1 year; both functional and corporate organizational charts; company cultural and finally, the technical qualifications. The easiest part of a search is matching technical skills; however, the most important part is matching the corporate chemistry with a candidates creativity. This is our strength. We need 3 hours with your team, and it’s on our dime. We go so in depth with our candidates prior to presenting an opportunity that we know them as people, not a one page summary. We work with the candidate to present their background specifically tailored to your opening. You can expect a candidate portfolio anywhere from 5-16 pages and will include everything from industry and technical insight to photographs and drawings that immediately connect the dots and color in the picture for you. Our goal is that by the time you finish reading a candidates portfolio that we literally hear you say “WOW”. During the interviewing and vetting process, we take an active role. Many of our clients ask us to facilitate the second or third interview as well as brokering an offer in person. Literally, all three parties come to table where body language speaks volumes; concerns are addressed eye-to-eye, and a handshake agreement finished the meeting. This approach is aggressive, and it works. Remember, you are recruiting the talent necessary to win the game and the title! You are hiring winners! We believe in negotiating closure with total transparency from both sides. When all parties do their job correctly, and both sides have been pre-closed even before the first interview, transitions are smooth. We expect our candidates to accept an offer within minutes, not days. Our track record of close to 100% acceptance over the last seven years speaks for itself. 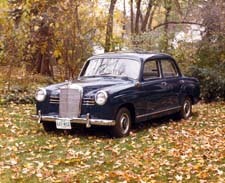 (Note: This 1955 Mercedes Benz 180 was restored by Gary and Dale Tompkins in 1986; she is still in active service today).